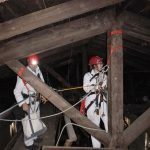 Vertical Access was retained by Ryan Biggs | Clark Davis to perform a close visual investigation of the timber roof trusses and to document existing conditions to assist the project team with repair plans and recommendations. The Dutch Reformed Church in Newburgh, NY is a National Historic Landmark designed by Alexander Jackson Davis in 1835 in the Greek Revival style. 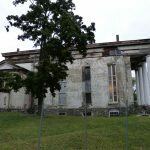 Measuring roughly 50 feet wide and 100 feet long, the church is situated on a bluff above the Hudson River and oriented with its four-column portico facing south toward the center of Newburgh. The building was deconsecrated in 1967 when the congregation moved to a new building, leaving the historic church vacant. In 2011, a large portion of the ceiling fell to the floor below. The exterior walls are stuccoed rubble masonry at the original portion of the church and common brick at the north transept addition. Eleven timber trusses support the gable roof. The original trusses are rough-hewn timbers with mortise and tenon joinery. The bearings of the trusses sit on top of the exterior masonry walls. 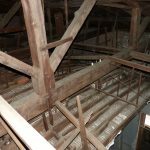 Documented checks, levels and other representative and notable conditions at the roof trusses with digital photographs hyperlinked to annotated condition drawings with quantities provided for each condition, (TPAS®). Took direct measurements of truss members to characterize the trusses and develop sketches of existing connection details. Helped to determine the cause of movement observed at the roof framing.